Well, as I expected, my registration problems were due to my keyblock spending too much time in my damp studio and getting too big. I brought the keyblock inside and let it dry out and when I started printing it was TOO SMALL...but this time I was ready so I slowly dampened the block and pulled throwaway proofs until the block gradually reached the right size and then I started printing away. A few are still a hair off register some on the short side (early prints) but once the block settled in it stayed stable long enough for me to print a good 50 prints. Not much to show yet. They're all still in a stack drying out and the finished print looks much like the earlier proof but once they're signed and editioned I'll post one. I've got enough to send out the 50 I need for the Baren Asian Zodiac exchange. I'll still have to print another batch of about 40 for all the friends and relatives to whom I usually send cards. Hopefully by April??? Well, I managed to get into the studio last week and get four impressions done. 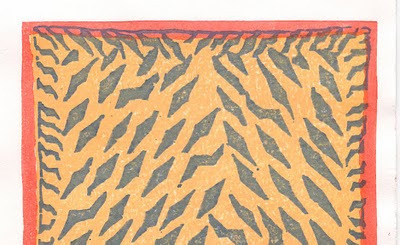 Two of the orange ground color: one lighter, the other a bit deeper and with some accentuation of pigment around the borders. The last two impressions to get the red border deep and even. I did decide to get rid of the outer blue line around the red border and adjusted that yesterday. But it's been raining off and on, and I've been moving between my heated house (dry) and my poorly insulated shed/studio (very damp). Since I did some proofing I left my "tiger stripes" birch block in the shed and this morning, with the day off I got all set to finish printing. Pulled the paper out of the freezer (it's damp too and will go moldy if it sits out); mixed my color; got up early and made some rice paste. Had a cup of coffee and went out to start. But once I pulled a bunch of throwaway pulls on crap paper I used my first proof on white paper. Hmmm. Seems to be off register. Must be just a bad drop. So I pulled another. NOPE. Something's way off. Could be the paper moisture's off; it gets bigger and smaller as it's dampness changes. So I pulled quickly two pulls off two different blocks; (if its the paper, they'll line up now; if it doesn't line up it means the block has expanded.) They don't line up. That means it's the block. There's a quarter inch of difference between the keyblock and color block/orange carpet. They line up perfectly at the bottom but are off by 1/4 inch at the top. The small amount of misregistration from the sides is more fixable; I just need to adjust my paper placement and that will line up just fine but the end to end problem is going to be a problem. The birch block has absorbed moisture and is now expanded from when I printed the hanshitas--the color templates the other blocks were carved from-- so it is now "bigger" than it needs to be. And since I'm printing it last onto paper that has already been printed with the two other blocks I can't really start over without throwing away 65 prints and quite a bit of work. Now what? I'll try bringing in the keyblock into the dry house to dry out and see if it shrinks down to size/fit. It's a different wood than the other three blocks so they are expanding at different rates. If I find the right window I should be able to pull it off but if the block needs to be somewhere between totally dry (house humidity) and totally damp (outside fog) Finding the right level will be almost impossible. Another reason why I need a dedicated work space although, if I didn't have to actually work, I'd have printed them all in one batch and they'd have lined up just fine.